Gavel and Staff Masonic Lodge No 9835. Official Website. 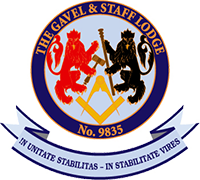 Welcome to the website of The Gavel and Staff Lodge No. 9835. The Gavel and Staff Lodge is a Masonic Lodge which meets at Freemasons' Hall, Great Queen Street in London, and is primarily for Toastmasters, Livery Company Beadles and those involved in associated professions. Please explore the website where you will find information about the lodge and Freemasonry in general, as well as contact details should you wish to get in touch with us. The Gavel and Staff Lodge meets on the 3rd Tuesday in March, the 2nd Monday in May, the 2nd Tuesday in September and the 3rd Tuesday in November (Installation meeting). The festive board is held after each meeting at the DoubleTree by Hilton Hotel London – West End. If you are a Freemason and would like to attend one of our meetings as a visitor, please get in touch using the details on the Contact page.